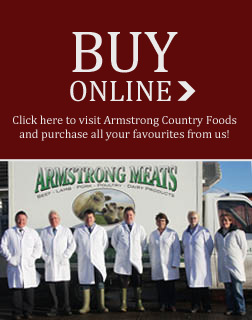 Armstrong Meats are wholesale suppliers of beef, pork, lamb, poultry and game to the retail and catering trade. A family run business supplying local produce to customers all over Ireland. We supply the needs of our customers from a purpose built factory in Castlereagh which conforms to full EEC standards, all delivered in our fleet of refrigerated vans. Also supplying the public with the same local quality produce from our two retail shops COFFEYS HIGH CLASS BUTCHERS based on the Lisburn Road and Finaghy.